"The neutral flavor of soybean oil allows the fresh ingredients of Caprese Salad drizzled with pesto to shine. This simple ‘n' easy dish is a crowd pleaser!" Soybean Walnut Pesto: Pulse basil, walnuts, cheese, soybean oil, lemon juice and garlic in food processor until blended. Place in small bowl. Cover and refrigerate. 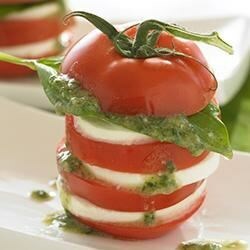 Caprese Salad: Combine 2 tablespoons Walnut Soybean Pesto, soybean oil and vinegar in small bowl. Slice tomatoes and cheese into 1/4-inch thick slices. Layer tomatoes and cheese on serving plate. Drizzle pesto vinaigrette. Sprinkle with fresh basil leaves, salt and pepper.